Project evaluation is a core component of HCTF’s grant programs. In addition to a thorough review of proposals and project reports, we conduct more in-depth evaluations of several projects each year. This assessment combines a detailed review of both financial and biological components of a project, ranging from questions about a project’s bookkeeping processes to a field day with the project leader to see the activities “on the ground”. These site visits provide us with an opportunity to better understand a project’s challenges and successes, to evaluate our conservation return on investment, and—best of all—to spend time with our project leaders somewhere outside in wild BC with an opportunity for them to tell us more about the projects they are passionate about. HCTF staff had the opportunity to visit two of our continuing projects this spring. 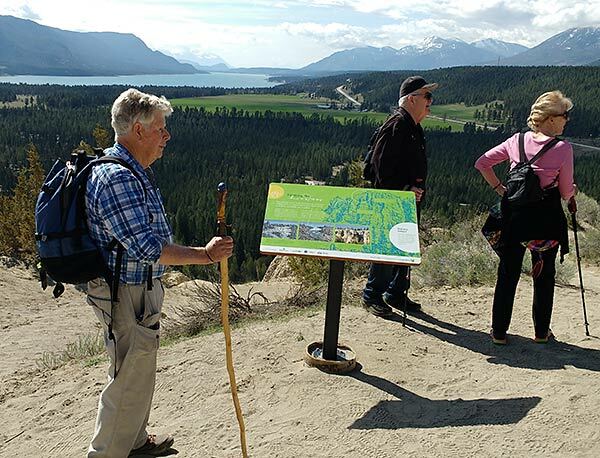 Our Conservation Specialist Christina Waddle attended the Official Trail Opening Ceremony at the Dutch Creek Hoodoos Conservation Area owned by the Nature Conservancy of Canada (NCC). Richard Klafki, Canadian Rocky Mountains Program Director for NCC, showed Christina some of the work that’s been accomplished with the Land Stewardship Grant from HCTF. This project included marking and improving the main loop trail and discouraging use of other informal trails on the property through directional signage and fencing. The other main component of the project was the design and installation of five educational interpretive panels. 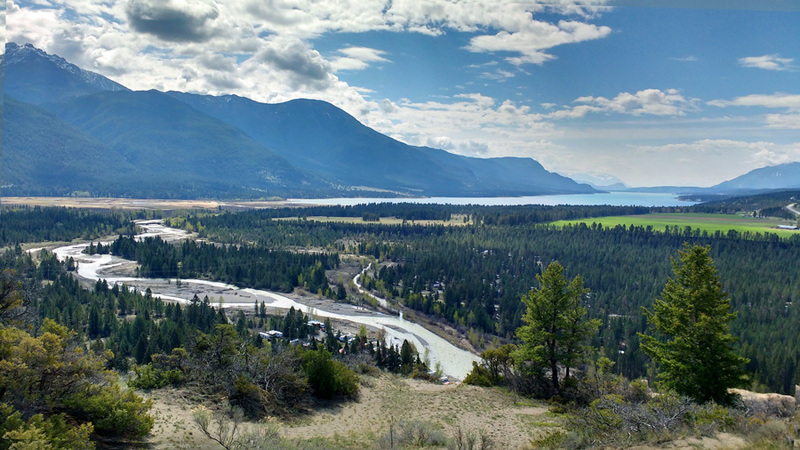 This will help meet NCC’s management goals for the property which include protection in perpetuity, providing a quality site appreciation experience, while limiting the effects of recreation on native vegetation and wildlife. 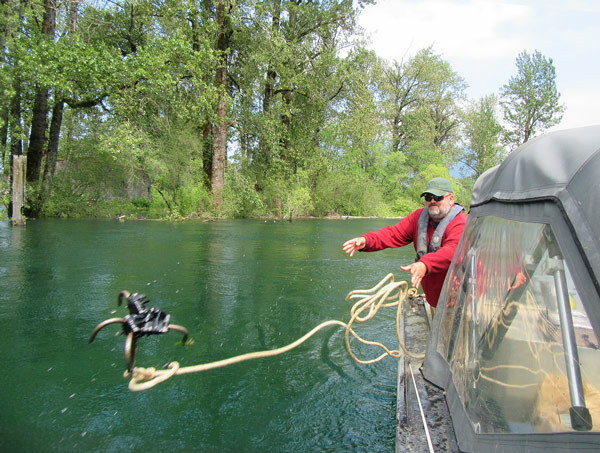 Sturgeon biologist Erin Stoddard launches a grappling hook to retrieve a data logger near the mouth of the Harrison River. Evaluation Manager Kathryn Martell and Finance Officer Jade Neilson headed over to the Lower Mainland to meet up with provincial sturgeon specialist Erin Stoddard and his field crew for a day on the Fraser River. Now in its sixth year, the Lower Fraser White Sturgeon Telemetry Study is conducting long-term monitoring of adult sturgeon to gain a better understanding of movement patterns and habitat use of this Red-listed species in the Lower Fraser, Pitt, and Harrison Rivers. Although White Sturgeon is considered at risk, there is a limited catch-and-release fishery on the Lower Fraser River; a licence surcharge supports a dedicated HCTF fund for sturgeon research and recovery efforts. 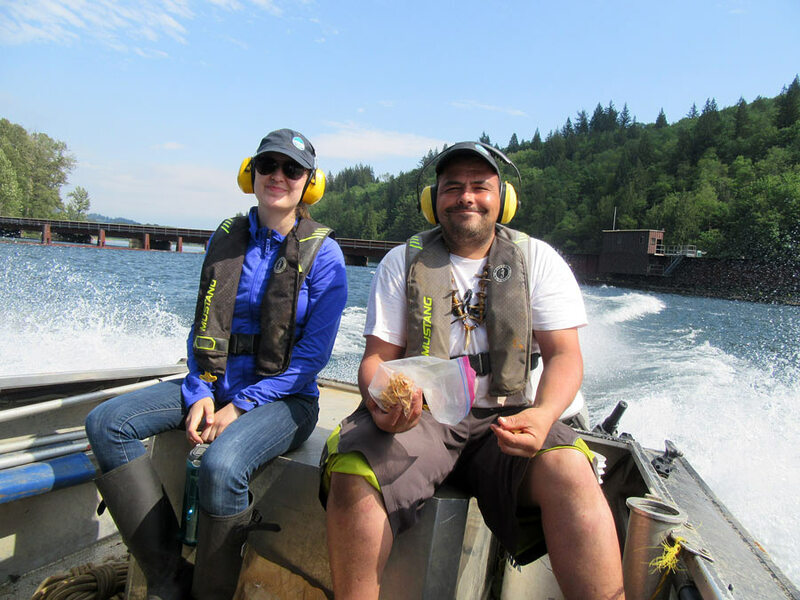 HCTF Finance Officer Jade Neilson and project field technician Garrett enjoy some sunshine as they journey from one site to another. Jade and Kathryn had a great day out on the water, with high flood conditions making it both challenging and interesting to retrieve and re-deploy the data loggers that record movements of individual sturgeon using acoustic tracking devices. It is surprising how little we know about this long-lived, large, prehistoric fish that is so important to local First Nations. This project is the first ever long-term telemetry study of sturgeon habitat use on lower Fraser River White Sturgeon, and it is already providing critical information about over-wintering sites, spawning areas, and development impacts, that is being used to improve fisheries and habitat management. In between hauling heavy equipment in and out of the boat, we had a chance to see some of the critical spawning areas being studied; to understand much more about the project’s study design, and how Erin and his crew have responded to many challenges (such as, what to do when your data logger is buried under 3 tonnes of log boom?) and learn about some of the complications of studying a fish that can live twice as long as humans and travel more than 125 km upstream and downstream each year in the ever-changing conditions of a large river system. 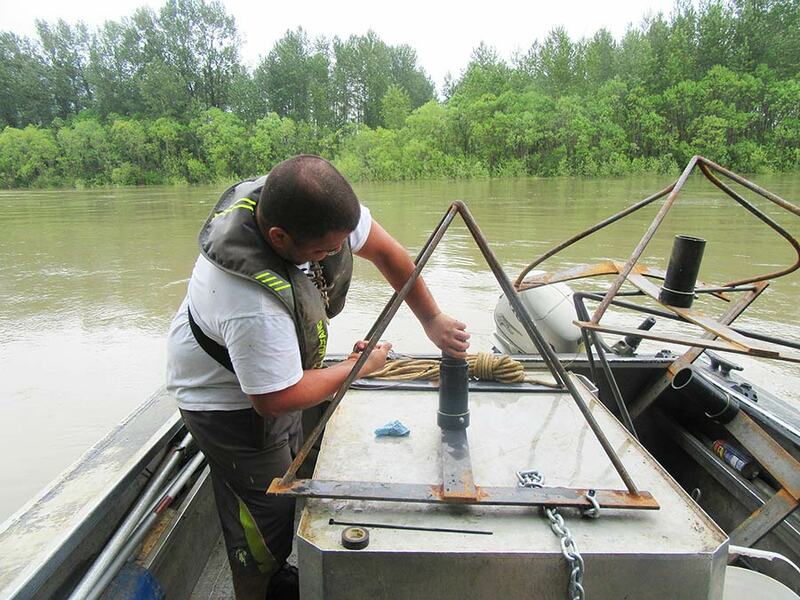 Field technician Garret preps a data logger before submerging in the river. IN the background, you can see an example of the battering some of these frames take from log booms. Thank you to both Richard, Erin and Garrett for showing our staff the conservation work being accomplished with HCTF grants.